Behavior of Exotic Pets is the first book on the subject to be written by behavioral experts, all with a wealth of practical experience. Divided into species-specific chapters, the book explains the normal behavior for each group of animals, including reproduction, parenting, communication and social behavior. The book also addresses animals’ environmental needs based on their behavior to enable owners to provide better husbandry and avoid potential problems. Descriptions of common behavioral problems are included, with practical recommendations for their treatment or management. This text is essential for any veterinary professional who would like to improve their knowledge of exotic animal behavior. It also serves as a valuable reference for animal behaviorists, exotic animal veterinarians, veterinary students, and anyone caring for these animals in captivity. Valarie V. Tynes DVM, Dipl. ACVB, is an Animal Behavior Consultant based in Texas. She gained her Board Certification from the American College of Veterinary Behaviorists in 2003 following a three year residency at the University of California Davis. She previously practiced small and exotic animal medicine for almost 15 years before specializing. Valarie frequently speaks at veterinary continuing education courses and writes for several different veterinary journals. Her particular area of interest is exotic animals. The first and only book on exotic pet behavior written by behaviorists. Covers the normal behavior of a wide range of exotic pet species, as well as common behavioral problems and how to treat and manage them. 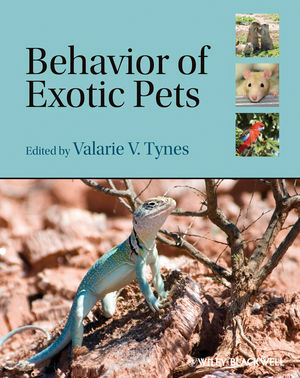 Includes separate chapters on learning, welfare and behavioral pharmacology, all with practical application for those treating or caring for exotic pets.